with all the best ingredients. journey with ALL THE BEST INGREDIENTS. Oh, that dreaded morning sickness. Here you are, trying to make the most of such a beautiful period of your life. Planning for all of the momentous changes coming your way. And you can’t get through the day without feeling nauseous at the drop of a hat or running to the nearest toilet to vomit without any warning. What exactly is morning sickness? What causes it? Can anything make it worse? Are there any ways to prevent it? What are your treatment options? Morning sickness is ironically named. It can, and in fact does, strike at any time of day or night. The common symptoms of morning sickness are nausea and vomiting. These reactions can be triggered by any number of things. Some common culprits are strong odors, spicy food, and heat. But guess what, sometimes there is no trigger at all. Morning sickness can really just sneak up on you at any time. Morning sickness is most commonly experienced nine weeks after conception and throughout the first trimester. For many expectant mothers the symptoms luckily improve by middle to late within the second trimester. Some unlucky ladies suffer from the rare condition known as hyperemesis gravidarum. This is where the nausea and vomiting are so severe that they can cause dehydration or loss of over five percent of pre-pregnancy body weight. Women diagnosed with this condition may require hospitalization and treatment. Complications Common morning sickness should not cause any complications during your pregnancy - either to you or your baby. The biggest threats are dehydration, an electrolyte imbalance, or a decrease in urination. Sadly, there is no way to completely prevent morning sickness. Common wisdom would advise that you try to avoid common triggers like unpleasant odors, exhaustion or fatigue, and spicy or sugary food. Everyone has different triggers, though, so do your best to identify and avoid if possible the ones that affect you. Choose your foods carefully. Try to stick with those that are high in protein, low in fat, and easy to digest. Eat several times a day. If you can stand to, eat small amounts of food regularly throughout the day. This keeps some food in your stomach without getting too full. An empty stomach can sometimes make nausea even worse. Drink lots of fluids. The goal here is six to eight cups of fluids daily. Avoid caffeine and sugary beverages. Get some fresh air. Keep your window open, if possible. Walk outdoors when you can. Take your prenatal vitamins at the right time. It may be better to take them with a snack or just before bed and not on an empty stomach. Good news - there are ways to manage and treat morning sickness. You certainly do not have to suffer. If you are searching for alternatives to pharmacological solutions, there are alternative remedies to consider - techniques and natural products that have been used for many years in many different cultures to varying degrees of success. Acupressure - Acupressure wristbands can offer some temporary relief and they are available in many pharmacies with no need for prescription. Acupuncture - Acupuncture involves a trained practitioner inserting thin needles into the skin at specific locations. Ginger - Ginger is a natural supplement that seems to help alleviate nausea. Aromatherapy - Essential oils are warmed and inhaled. If you are looking for a natural, alternative treatment for your morning sickness, Hana Tonic may be the perfect solution. Hana Tonic is a liquid supplement that combines several natural elements together to provide relief from nausea. What is Hana Tonic made of? Funny you should ask! Our tonic is certified organic and is made with mindful ingredients. There are no GMO’s and no artificial ingredients. Hana Tonic is also vegan, low calorie, and low sugar. We care about what we put in our bodies and we offer that same consideration to you. Hana Tonic is a single liquid anti-nausea shot measuring 2 oz. (60 ml.). It can be ordered in a single dose or in a package of 9 bottles. Our mission is to offer drug relief for nausea associated with motion sickness and morning sickness. Hana Tonic is the only natural organic, liquid anti-nausea* shot on the market today. It is a great alternative to pharmacy drugs because it brings all the benefits with no drowsy side effects. * This natural remedy tonic is completely drug free. 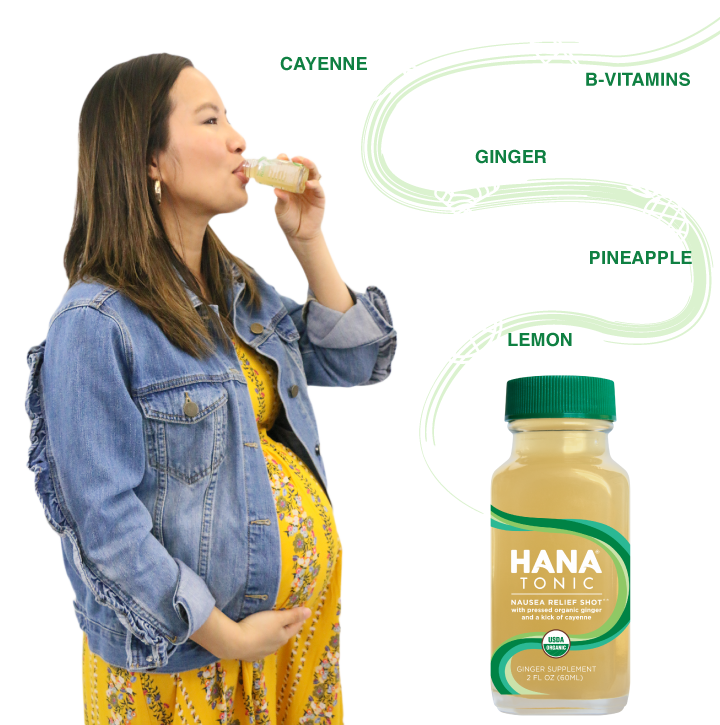 Hana Tonic is great not only for pregnant women suffering from morning sickness, but also adults and kids over the age of 2 who are prone to motion sickness. It is a good idea to chat with your doctor before taking this or any other dietary supplement. Hana Tonic is convenient to use. Our product is packaged in premium glass and its small, 2 oz. size makes it TSA compliant. You can carry it right on the plane or in the car with you! The liquid form makes it a nice alternative to pills. And, it can even double as a daily B Vitamin supplement. Better yet, Hana Tonic requires no refrigeration. You can easily carry a few bottles around with you to use whenever you need. Our co-founder, Renee, grew up on the island of Maui, Hawaii. She was actually inspired to create an all-natural anti-nausea solution after struggling with motion sickness on the infamous winding road to her hometown of Hana as well as morning sickness during pregnancy. If you need any further information contact us through our email hello@hanatonic.com, give us a call at (804) 993-HANA, or fill out our contact form.